I’ve always been a girly girl. Not in all of the standard ways, of course. When I was a freshman in college and going to my first fraternity semi-formal, my dorm mates had to tackle me on the ground so they could put eyeshadow on my sad naked eyelids. I wore flannel pajama pants to high school for the entirety of my senior year, which I’m realizing at this moment is really mortifying. I still opt for practical, comfortable clothing before I submit to wearing things that look great but feel like I’m slowly being murdered by fashion asphyxiation. However, I always loved playing with dolls. I changed Barbie’s clothes 47 times a day, and I chased boys around the playground until they were forced to be my little tiny sweetheart slaves. I was a cheerleader from 8th grade until freshman year of college, mainly because I just loved (still love) those freaking skirts so much. When I got the opportunity to wear a Cinderella dress at an elementary school event, they had to rip it off of me. Now, I know I’m super fun. After years and years of fighting with myself, I can proudly say that I love who I am, and I’m starting to really understand who I am. But day after day, I push against the notion that if I were to take just fifteen extra minutes to throw on some mascara, or do something with my hair that didn’t end in a ponytail, I would feel even better about myself. My thought is, why should some extra crap on my face define who I am? Why do I have to give up playing five rounds of Candy Crush or seeing which flat they choose on House Hunters International in order to make myself pleasing to some random stranger’s eye? I’m who I am no matter what I look like, right? I’ll tell you what it is. It’s the expectation. It’s the entire industry built on having the right clothing and the right hairstyle and the right makeup, all while miraculously maintaining individuality. It’s the magazine covers that scream “BE YOURSELF!” right next to a flawless photo of today’s super celebrity and headlines like “How to lose five pounds without exercising!” It’s feeling good leaving my house and then passing a woman on the street who looks like she got all 100 votes in Who Wore It Best and instantaneously doubting every single decision I’ve made that day. It’s turning back into the fifth grade Patti, who never seemed to be able to fit in. It’s the realization that appearances do make a difference, even though there’s so much more to us than what we see in the first five seconds. The real question is, how much should I care? Do I succumb to the voices in my head telling me I should try harder? Or should I valiantly fight to be comfortable in my own 6 AM/crazy hair don’t care/what you see is what you get skin? I wish I had an answer, because then I would be the female Buddha and have lots of book deals and talk shows and billions of dollars. Unfortunately, there’s no hard and fast correct answer. It’s something we all have to dig deep and ask ourselves as individuals. So for now, I will define myself as a non-girly girly girl. If I keep working to choose a side, then I’ll always be denying one half of myself. And that’s not a super fun way to live! 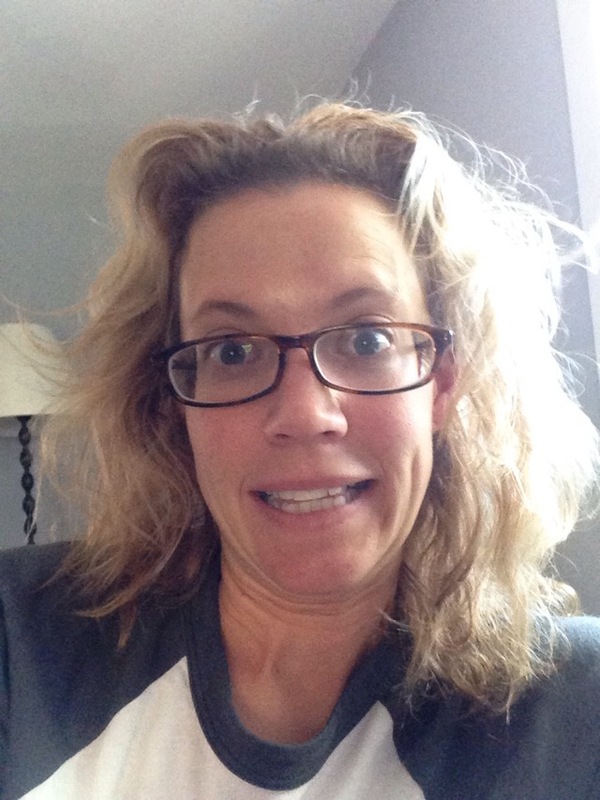 I’ll just have to learn to be comfortable knowing that Patti Murin is a Miss America loving, fantasy football winning princess who has rosacea on her cheeks and usually doesn’t give enough of a crap to cover it up. My name is Chelly, I’m 23 and have acne scars from my youth and still some blemishes that pop up now and again and I don’t give a damn about covering it up! ….Unless, I’m planning on going to Smoothie King and seeing this really attractive male for about 5 minutes so hopefully he dreams about my superficial beauty until the next time I go to smoothie king. I think maybe both approaches are good, just that simple. Part of me pities the poor gal who won’t leave the house without makeup and part of me says more power to her. (It’s like cleaning my house. I love it clean but can almost always think of something better to do. Then there’s times when I simply. Must. Clean.) Way more days without makeup these days and it makes it more fun when I do opt for a little more attention to me:) Am grateful and maybe a little surprised that I’m somehow freed from any worry at all about it:) Hooray for all of us! Patti, you nailed it!!! I am up at 4:00am for my shift at the hospital. I can usually pull,off mascara, but the hair is always up. At 10am when I finally feel human I look in the mirror and groan. But you know what, neither my patients, coworkers or MDs respond any differently to me whether I’m dolled up or not. I speak super heroes, sports, beer with the same enthusiasm as I do make up! you truly have to love yourself first. Love this, I am about the same as you. I scoff at super perfect people and yet on those days when all the make up comes together, or your hair miraculously tames or you have on one of those outfits that you feel fantastic in- you feel like Superwoman!! I do not wear it at all. Sure, I am plain, look older than most of my friends, and am probably regarded as socially unacceptable, but the amount of sleep I get back in the morning is a nice trade off. I’m somewhere in the middle, too! If I’m going to leave the house, I generally wear eyeliner and a ton of mascara, but no foundation. I try to find a happy medium between dress up/comfortable clothes, although sometimes you just have to choose one. Most of the time I put my hair in a ponytail or bun. It sounds like I’m a lot like Donna Marie, who commented first. But a lot of the time I don’t have the confidence you have. Thanks for this inspiring post! Be comfortable whenever you can – who cares what others think. Dress to the nines when needed – when it’s not done every day, it’s extra special! I understand what you are saying completely! Around my house I am pj make-up-less lady~ but when I go out I do tend to lean on make-up and styled hair to bolster my confidence. I guess this means that I am a tad insecure but there ya go! You, however, are empowered and I’m impressed!!! !